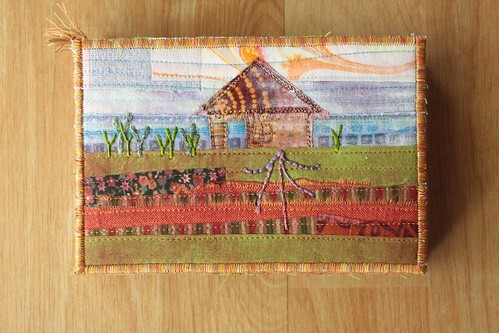 It’s that time of the week to show a photo or thing and a quilt or design that was inspired by it. 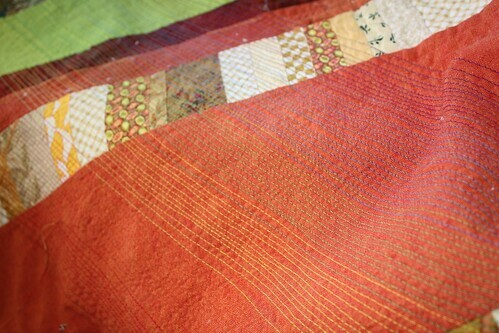 I’m working on a quilt that is directly inspired by a road near my house, but since it’s close to being done, I’ll wait until it’s complete to share it. In the mean time, I’ve got more pattern designs and their inspiration to share. This is a plant native to Hawai’i called Naupaka. It has a wonderful legend attached to it and I was immediately drawn to it. I go by several naupaka plants when I walk around my neighborhood and they got me to thinking about how to translate the flower and it’s story into a quilt or design. It wasn’t long before I had a collection of designs based on local flora. This is the first, and still my favorite, of the designs (click for a better look). I had it printed (by the half yard, on demand) at Spoonflower so that I could make things with it. Next Sunday, I’ll share another design and it’s inspiration. PS: Sherri Lynn inspired Inspiration Sunday — check out what’s inspiring her. I would love to be a locavore and support small farmers, crop diversity, organic everything, and most of all, eat well. I’m too lazy though. I just can’t bring myself to learn to cook so many new foods here, and I certainly can’t bring myself to drive all over the island (as small as it is) to procure the ingredients. Recently, Kanu Hawai’i sponsored an eat local challenge. I didn’t do it, knowing I’d fail, but I did embrace their idea to start small and include one locally grown food a day. THAT I can do! In fact, I have been doing that for quite a while. We love the green beans grown in nearby Ewa, and Big Island Honey is yummy. Much of the time, my breakfast is a local papaya (with off island cottage cheese and granola though). One of the foods I’ve been playing with is Okinawan sweet potatoes. Kinda ugly on the outside, they are purple on the inside! I first experienced them mashed with garlic at Orchids in the Halekulani. With roast chicken, it was delicious. OK, but not really worth the effort. And tonight I tried the much raved about Sweet Potato Biscuits. Surprise! — my lavender-grey colored biscuits turned green while waiting to be baked! 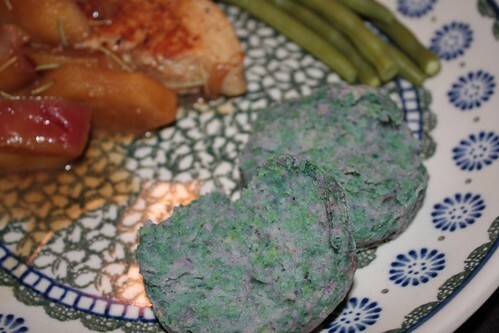 I had heard that lemon juice will turn these purple potatoes magenta, so I’m guessing it’s the baking powder in the dough that turns them green. 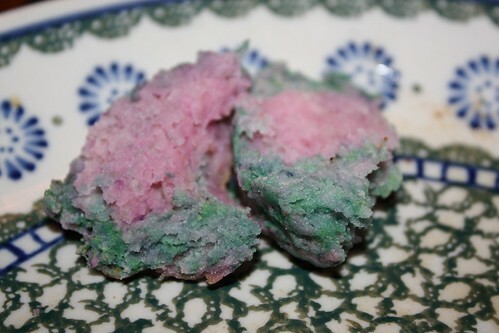 Baked up, they are grass green with little confetti flecks of purple. Party food! Just for fun, I poured a little vinegar on my biscuit and, sure enough, it turned pinky purple. Move over pH paper or red cabbage juice, let’s play science experiment with foods you actually want to eat! My view other than postcards has been this. 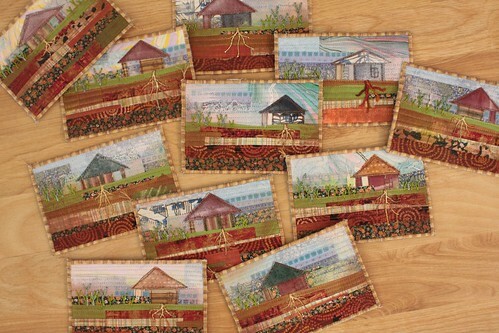 It started with strips of scraps and grew to become my homage to the red dirt and furrowed fields seen from the road between my house and Schofield Barracks. One often sees rainbows on the drive too. I’ve been a sporadic blogger. My excuse is that I don’t have much art that I want to talk about right now, and I haven’t been doing any interesting living-in-Hawai’i things either. But I did realize today that there are still Hawai’i-specific things going on. In particular, my TV watching has become kind of Hawai’i-centric — and I’m not the only one! I’ve also realized that the local paper is also following Project Runway and Hawaii 5-0 just like I am. Despite the unnecessary drama of this season’s PR, I am glued every Thursday night just to root for Andy. I love a local-boy (or girl)-done-good story, as does the Star Advertiser. And, like me, the local press loved seeing Tim Gunn squeal at the catfish at Andy’s house, and rolled their eyes at the historic Haleiwa sign which is nowhere near, and represents a completely different culture than, the Waianae cost from whence Andy hails. The other show I can’t resist is the new Hawaii 5-0. It’s over the top in a Baywatch kind of way. Normally, I don;t have much interest in this, but it makes a great drinking game! Overall, my biggest issue is that the speaking cadence of the main actors isn’t right. Danno is fine since he’s from the Mainland, but McGarret and Kelly grew up in Hawai’i. I sort of forgive them their lack of local accent because of their jobs and education, but if Kono is really the surfer chick who hangs with the locals that she claims to be she’d have more sing-song in her voice. Drink. Last Monday’s episode had the columnists in an uproar. Kelly told Danno to try wearing flip-flops! I can’t tell you how many times in my short two years here that I’ve been teased and chided for using that particular “f-word.” In his defense, reports say actor Daniel Dae Kim knew better and tried to convince the show’s writers that Kelly would really say “slippahs” but no one wanted Mainlanders, or translators from other markets to confuse rubbah slippahs with fuzzy bunny slippers. OK, good point, but you still gotta drink. Speaking of drink, local tough guys don’t drink Blue Hawaiians at the Hilton. No, they drink Heineken in their garages (with the door open and all their friends and family there, watching football and playing ukelele)! Drink, but make mine a Longboard. Lastly, kudos to the show for at least addressing one of the housing issues here, but the tent city on the show looked a lot more like a church camping weekend at Bellows Beach than the tent city I’ve driven by in Waianae. Where were the shabby tents, blue tarps and battered vans? And what was up with the spacious common areas and beautiful caucasian people? Nope, the real tent city is mainly native Hawaiians pushed to the edge of society, poor in money, health, and education. Sadly, Drink. 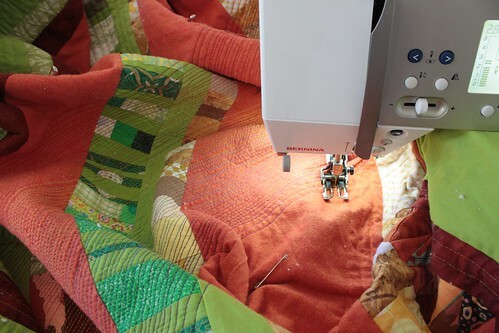 Sherri Lynn over at Daintytime has started posting “Inspiration Sundays” in which she shows an inspirational photo or object and then a sketch of a possible quilt design. She’s also encouraged others to join in, so here I am. While I’m not sure I’ll be diligent enough to keep up regular posts, this challenge struck a chord with me as I have more than a few ideas and projects right now that I can directly correlate with a specific inspirational thing. These are the postcards I’ve made as incentive for my readers (that’s you guys!) to donate to The Juvenile Diabetes Research Foundation. Seven of these lovelies already have homes — that’s a big mahalo (thank you) to Natalya, Connie, Doreen, Stephanie, Del, Diane, and Debra! The fundraiser goes until November 6th, so if you want one of these postcards, go to the JDRF tab on my Facebook page, or directly to my walker page here and make a donation as small or large as you want. And no worries if a bunch of people donate — I’l happily make more cards! It’s that good of a cause. These are titled “Taylor’s House,” not because the house looks like my neighbor Taylor’s (though her house does have a lanai out back like the one on the cards), but because these houses are in honor of Taylor and her learning to live a full and happy life even with Type 1 Diabetes. These houses also reflect the red dirt and drier landscape of the central Oahu area in which we live, though in real life, our houses are much closer together. I’ve made them with alternating fabric, stitch, and paint, so there’s a nice atmospheric quality and they really are little tiny pieces of art. **Thank you so much to all those who have donated so far! I will indeed need to make a second batch of postcards. I also need street addresses for a few of you — I’ve been sending a thank you email through the JDRF site but I think it may have ended up in a few junk folders (Nancy and Connie, please email me privately or leave a comment here (without your addresses) so I can email you directly). I too had been thinking about making the white elastic black with the ever-useful Sharpie pen (or more accurately, a giant Expo marker). 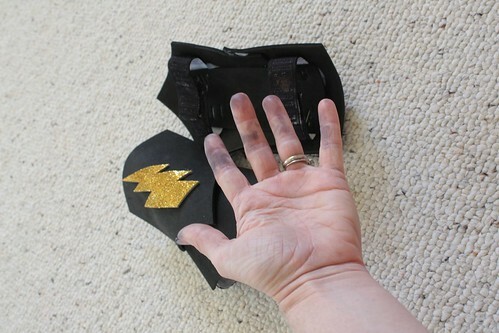 Two TV shows and five black fingers later, I think my son’s armor is much improved. 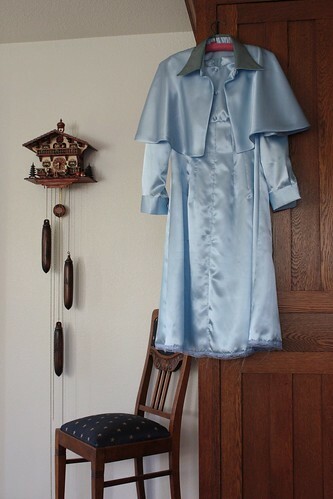 In addition to my two kids’ costumes, I volunteered to make a Fleur Delacour (in picture 4) dress for their taekwondo instructor. I was hoping that one of the pattern companies would have put together a Harry Potter themed collection with something like striped ties, wizarding cloaks, and uniforms from a visiting girl’s school. No luck though. So, I had to find a “close enough” pattern and work out the rest on my own. 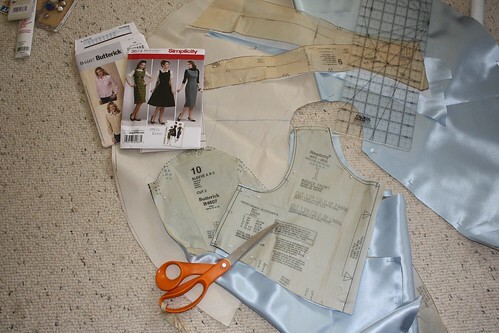 I used Butterick 4607 (which I already had) for the collar and sleeves and Simplicity 3673 for the basic dress. Using the front and back pieces from the shirt, I created the right shaped neck and then self-drafted the rest of the capelet. It still needs a little scarf, few more buttons and a hem, but I think it came together nicely, and pretty easily too. Taylor is our neighbor. She’s ten years old, one of my daughter’s best friends, a red belt in taekwondo, a gifted student, a typical little sister, and a kid with Type 1 diabetes (read about the differences between type 1 and type 2 here). Taylor was diagnosed two years ago and has since had to be vigilant about what she eats, had to deal with odd secondary effects of the disease, check her blood sugar levels day and night, and inject insulin on a regular basis. It wasn’t long before her family invested in an insulin pump which means no more injections, but she still has to monitor her blood and input carb levels so the pump knows how much insulin to give. Her life has changed forever, but with supportive family, school and friends, she is able to be, at least outwardly, a pretty normal pre-teen. Organizations like Juvenile Diabetes Research Foundation have been an invaluable resource for Taylor and her family as well as for the millions of other kids with Type 1 diabetes. It is research such as that funded by JDRF that has resulted in treatments like the pump which help make life more normal for affected kids. You may donate at my Walker Page (www.JDRF.org and type my name and Hawaii for the state in the Search for a Walker sidebar) or via my Facebook page (look for the Support JDRF tab).